A 4-Day adventure in magical Sedona, Arizona. What if your current answers to these questions are getting in the way of what is truly possible for your life? This journey will be 4 days of deep self-exploration and awakening. Self exploration is not about understanding or figuring yourself out. That would just create more limitations. It is realizing that you are so much more than you have understood yourself to be. That every story, belief and idea that you tried to fit yourself into was never entirely true. The pain and suffering in your life have come from trying to limit the unlimited that you truly are. Deep down, you know your potential is limitless. Are you ready to come explore the possibilities? 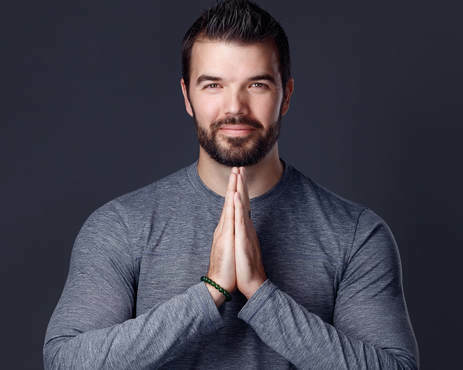 Zach will be leading a small group of participants through powerful exploratory exercises, meditations and conscious breathing sessions that will blow the lid off of who and what you thought you were. You will not be the same after these 4 days. Come explore your unlimited self. "I have been on the spiritual path of discovery for several decades, and the space you held for our unfolding was exquisite. I have been blessed to learn from many inspiring teachers/monks/shamans/guides as they share their wisdom of yoga, sound, aromatherapy & plants… And, I have never experienced such an expansive and clean way of holding space for awakening awareness. I’ve felt a beautiful unfolding with your online classes… And the in-person retreat took it to a whole new level. You created the opportunity for coming into loving acceptance of birth, death, rebirth and all of life’s experiences in-between. I was able to be present with several deep, lifelong traumas in just a few sessions of the breath work. I was able to harmonize lifelong belief patterns that were creating distress in my life. All of this was because of the way you hold a space of harmony and love for all of creation. I am now more open, in motion, with more energy flowing through my entire body. It was so exquisitely perfect and beautiful… Challenging and opening all at the same time. I am now more light-hearted, and I’m having more fun in my life! I am grateful to you, and I’m looking forward to being present with the love that is unfolding in every moment. Thank you for sharing your gifts of awakening with all of us!" I feel more like the loving me I have always known, but been scared to show. In fact, as I write this I just finished facilitating a women's group, which I've done for the past year or so with so many judgments towards myself, sometimes spending hours after critiquing myself and wishing I had done things differently. Tonight, there are almost no judgments. I felt I was more present and more in my heart than ever before. I have spent a large portion of my life extremely self critical, allowing my fear to keep me from doing so many things. I felt I broke through so much of that this past week with all the healing that occurred. Zach has a magical way of bringing us back into remembering all of who we are, with so much grace, love and for me laughter! And even though there was an intensity around it all, I felt so safe and so cared about the whole way. Beyond grateful for it all! WOW oh WOW! What an adventure and I was so blessed to be with such an awesome group of people and Zach at the workshop.! The breathwork alone is amazing so experiencing Zach's awesome facilitation combined with breathing for two days with a beautiful, honest, open group is a life changing experience... did someone say Miracles? Still processing everything from the weekend and know my life will never be the same! Thank you Zach and all that attended! I still don't even know where to start after these amazing days with Zach. Words seem so woefully inadequate in describing all that I got to experience during the last few days. Nothing is the same. From the little things to the big stuff, nothing is like it was before! Through Zach holding the space, asking the right questions and the completely amazing breathwork - I was handed that huge "permission slip" to step into SO much more of me. And now, NOTHING is the same! Those of you who have listened to Zach before may have heard him talk of "miracles" happening .... yes, .... THAT! Things are still moving and unfolding and I am excited to see where it's all going! I am in such gratitude for everyone and everything! Once again, participating in a Zach Rehder workshop was the best gift I could have given myself. The contribution that Zach has been to me is huge and these last two days were no exception. I have a new sense of freedom from outdated beliefs that no longer serve me and a heart that feels like it has opened wide to receive. I am forever grateful , thank you volumes, Zach, for helping me truly get a bit closer to what I have always been seeking..."me".